Like people of other ethnicities, the Chinese immigrated to the United States for better lives. Before 1900, their work included farming, mining and building railroads. Men sent money home to their families in China. But American laborers resented the Chinese because the latter were willing to work for cheap wages. Americans accused the Chinese of monopolizing jobs. Stiff immigration laws were passed. Many Chinese immigrants were forced to prove they had a husband or father who was a U. S. citizen or be deported. From 1910-1940, Chinese immigrants were detained and interrogated at Angel Island immigration station in San Francisco Bay. U.S. officials hoped to deport as many as possible by asking obscure questions about Chinese villages and family histories that immigrants would have trouble answering correctly. 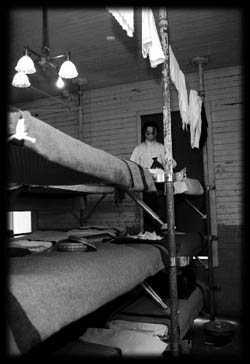 Men and women were housed separately. Detainees spent much of their time in the barracks, languishing between interrogations. The immigrants expressed their fears and frustrations through messages and poems written or carved into barrack walls. Some poems are still visible at the museum today. Immigrants were detained weeks, months, sometimes even years. Word got back to China about the prolonged questioning, so people would try to mentally prepare before even crossing the Pacific Ocean. A 1940 fire destroyed the Angel Island administration building, so the U.S. government abandoned the immigration station. The so-called "Chinese Exclusion Acts" eventually were repealed. Over the years, Chinese have settled in every U.S. city. Many years have passed. But many Chinese still recall the hardships of detention. At Angel Island, a museum has been established in the old barracks, re- creating one of the living areas for Chinese detainees.